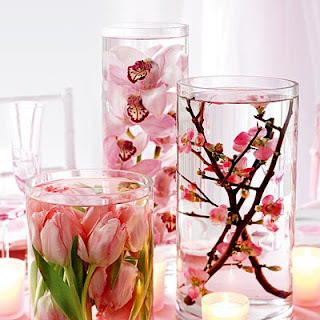 Lush Fab Glam Inspired Lifestyle For The Modern Woman: Spring Entertaining: Create Beautiful D.I.Y Center Pieces. 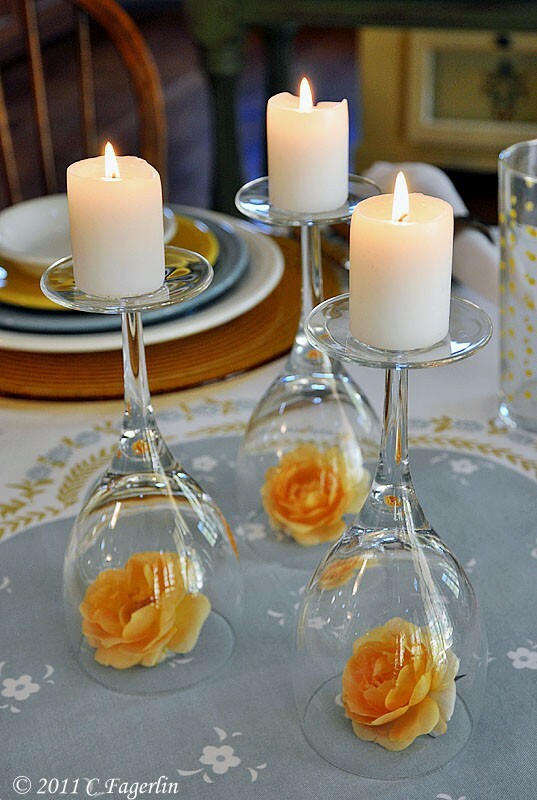 Spring Entertaining: Create Beautiful D.I.Y Center Pieces. Fresh flowers are a must during the spring/summer season since they are readily available and you have a wide variety to select from. To create this look use a rectangular vase and 2-3 complimentary color tulips from your garden or you can purchase them at your local flower shop. Bunch similar colors together and fasten with a rubber-band. Finish off by wrapping the the stems with a tulip leaf and neatly tuck the last edge of the leaf into the already wrapped portion. To get this creative look which is also perfect for a wedding or bridal shower center piece, use 3 different sizes of circular vases. Fill them with water then add your favorite flowers. The photo above shows pink tulips and orchids, but roses will also do the trick. Finish the look by placing tea light candles around and in-between the vases. 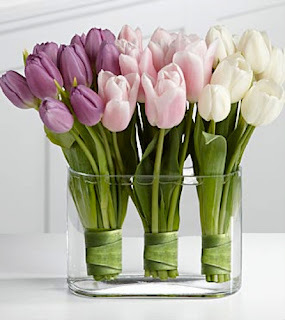 This is a simpler way to use your garden tulips indoors. Re-purpose/recycle your coffee, jelly or jam glass jars and turn them into cute vases like the ones shown above by using adhesive and gift wrap or craft paper. 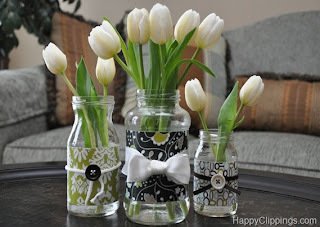 You can further embellish by adding a cute bow tie or ribbon around the jar. Not a big fan of flowers or didn't have enough time to get them before your guests arrived? Then this centerpiece is right for you. Recycle your glass jars to create this romantic candle light dinner setting. 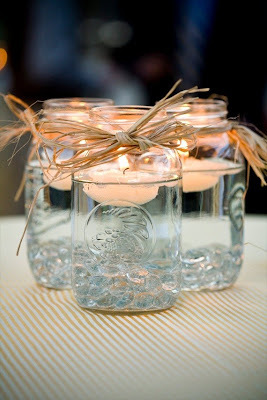 Fill the jars with water and add floating candles. The jars above are decorated with you straw bows which you can find at a craft store, but ribbons will work as well. Our final center table creation is perfect for a romantic or couples only intimate dinner party. Simply turn over you 3-4 wine glasses in a triangle form as shown above or in a row if you have rectangular dinner table. Purchase your favorite color roses, cut off their stems and place the roses underneath the wine glasses. Add a small lighted candles to to top of the wine glass and voila you've set the mood for a romantic dinner. Which entertaining center piece will you try? Leave a comment below.